What do you understand by the concept of Professional Ethics? The professional behaviour of the employees are defined and described in detail by using some predefined standards which are known as Professional Ethics. This tutorial provides a detail insight about the ethical and moral issues that have to be faced by the corporate professionals. Who are the audience for learning the concept of Professional Ethics? This tutorial is mainly targeted for the professionals and youngsters who have just started their career. This tutorial helps the professionals in understanding the limits within which an employee has to work, functional limits while struggling hard for achieving goals. 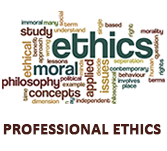 What are the prerequisites required for learning the concept of Professional Ethics? No specific prerequisites are required for learning and understanding the concept of Professional Ethics. The only thing required is that the reader of this tutorial need to stay calm in order to better understand the concept of Professional Ethics and try to explore the suggestions.